The Vietnamese National Assembly (NA) will closely cooperate with the Lao parliament in continuing to create favourable conditions for the two Governments to effectively implement their bilateral agreements, NA Chairwoman Nguyen Thi Kim Ngan affirmed on January 6. During a reception in Hanoi for Lao Prime Minister Thongloun Sisoulith who came for the 41st session of the Vietnam – Laos inter-governmental committee, Ngan further said she hopes the implementation of the key projects between the two countries on energy and transport will be accelerated. Especially, the quality and tempo of the construction of the Lao National Assembly office should be ensured, she stressed. The guest briefed his host of the outcomes of the session which he co-chaired with Vietnamese Prime Minister Nguyen Xuan Phuc earlier the same day, during which the two sides highly valued the achievements recorded in 2018, exchanged ideas on the difficulties and affirmed their determination to boost up the cooperation in 2019. At the session, the two sides signed six cooperation minutes, affirming that they will actively collaborate to prepare for important projects between the two countries, the Lao leader highlighted. Chairwoman Ngan spoke highly of the outcomes and stressed that the NA supports the Vietnamese Government in intensifying its cooperation with the Lao Government. The law-making body will continue its supervision so as to accelerate the implementation of the agreements between the two sides, she said. 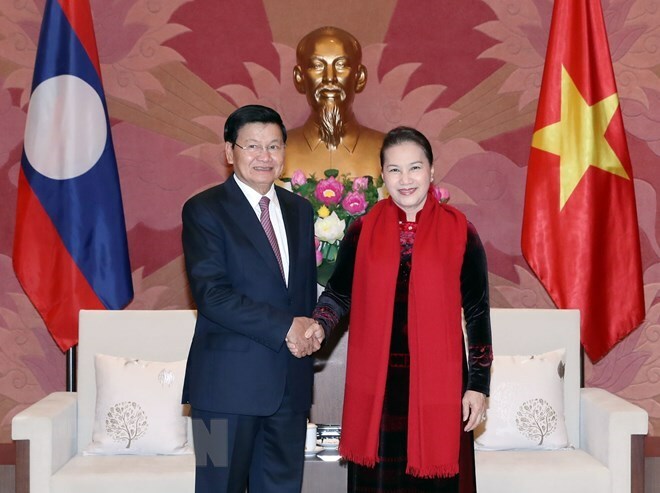 The NA leader rejoiced at the great achievements recorded by Laos during the recent past and expressed her belief that under the leadership by the Party, the management by the Government and the supervision by the National Assembly of Laos, the country will reap greater successes. Host and guest also shared important experiences in law-building work and the holding of the confidence votes on officials elected or approved by the National Assemblies. They expressed their belief that the traditional friendship, special solidarity and comprehensive cooperation between the two countries will continue to be deepened, spanning from the fields of politics, diplomacy and security-defence to culture, education, human resources training, health care, tourism people-to-people exchanges./.